I'm really late to this news, but thanks to Thomas Heller out of Columbus, IN, I do finally have it. This past Legislative Session actually took a couple of significant steps to reign in how TIF (tax increment finance) districts are operated. HB 1116 made it into law with a litany of changes to the way a wide variety of governmental units manage the revenues they garner from property taxes. From libraries to townships to school districts to municipal governments and more - there's something for everyone in this bill. It requires the MDC to submit an annual report to the Council and for the Council to forward that information to the State. It revamps the way the value of the base is calculated each year; limiting any decrease in the value of the base to that caused by lower property values. It calls for the Legislative Council to set up a study committee on TIFs. In trying to recreate how the TIF portions of this bill flowed through the session, it seems the introduced bill included only the method for the annual recalculation of the base (TIF neutralization in TIF-speak). At some point after it got to the Senate, this part was deleted. During the Conference Committee, it was added back and the other two items (MDC report to Council requirement and call for a study committee) were added new. The MDC (our redevelopment commission) must submit a report to the Council by August 1 each year. The report must include revenues received, expenses paid, fund balances, the amount and maturity dates for all bonds, and the amount paid on bonds for each TIF district. Also, a list of all parcels included in each TIF district along with the base value and increment value for each parcel. The Council has until October 1 to compile the information and submit it to the DLGF. This would, of course, open all of this information up to the general public as well. According to the Legislative Services Agency, who evaluate every bill for its fiscal impact, the current law requires the MDC to submit a more abbreviated report to the Mayor each year. I'm sure he reads it, too. Because of HB 1116, the law now protects the base from any erosion, except when the assessed value of the property in the TIF district decreases - as in an either local or widespread recession. This reasserts the promise made when TIFs are created. In non-recession times, the base would grow along with the value of the property as determined by the County Assessor. As the LSA puts it, increased base values "would result in lower tax rates and potentially lower circuit breaker losses" to schools, libraries and city governments. I've noted before that half of all circuit breaker losses can be directly attributed to our TIF districts. One unfortunate aspect of this change, is that those TIF districts whose base have already dropped to zero will never see the benefit of the new law. But, it is good that at least one of the fairy tales used to sell the public on a TIF will be made reality, finally. And last but not least, the study of TIFs at the state level is long overdue. There is so much hocus pocus and shenanigans going on with TIFs that overhaul is needed in order to protect the public. While I'm usually more apt to back home rule, the actions of our city fathers and mothers to dismantle and ignore the recommendations of our own TIF Study Commission shows how little we can trust them to move forward in the public interest, over the interests of select individuals. The Homestead Credit Commission webpage has eliminated last night's meeting and moved the first meeting to tonight - the location remains the Perry Township Educational Center. Jon Murray of the Indy Star has more information. The panel will meet at 6 p.m. Wednesday at the Perry Township Government Center, 4925 Shelby St. Another session is planned for 6 p.m. Thursday at the Municipal Gardens Family Center, 1831 Lafayette Road. Locations have not been announced for meetings planned for Monday and for June 4, June 5 and June 24. 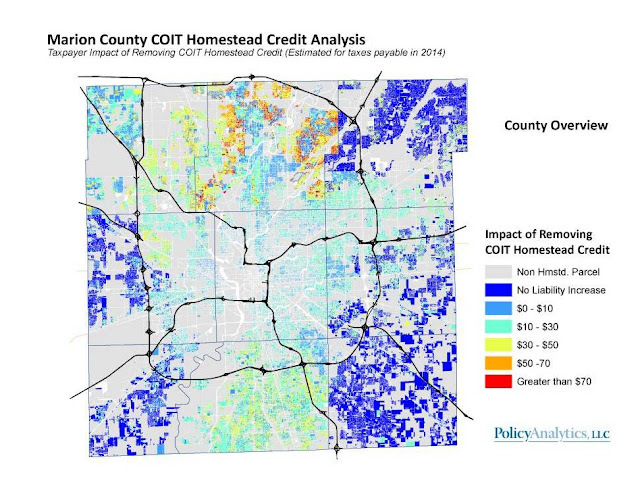 The City-County Council created a commission to review the pluses and minuses of eliminating the local homestead credit. That commission begins its work tonight with a meeting beginning at 6 pm in the Perry Township Educational Center. While a hectic schedule is posted, no other locations are yet listed. The commission will meet tonight and tomorrow this week, Monday, Tuesday and Wednesday next week, and a final meeting on June 24. You will recall that the Council balked, first on a bi-partisan basis, then on a partisan basis, to eliminate the homestead credit during last year's budget season. As part of the budget blackmail resolution, the homestead credit was agreed to be studied. Of course, one cannot be sure if the findings of study were also agreed to at that point or not. I understand that members of the commission and representatives of the various taxing units have been made aware of the schedule. I was surprised not to see anything in the paper this morning, or previously, to make the public (who actually pay the taxes) aware of the meetings. The commission is composed of 10 members - two co-chairs appointed by the Mayor and Council President, four Councillors appointed by the Council President and the Council Minority Leader, one representative of MIBOR appointed by the Mayor, one representative of all schools, municipal corporations and other taxing units appointed by the Council President, one County Commissioner appointed by the Council President, and one person appointed by the City Controller. For those who track such things, that brings it to 5 Ds and 5 Rs. Interestingly enough, of the 4 Councillors on the panel, none come from Washington Township, which will see the highest dollar hit to taxpayers, should the homestead credit be eliminated. The 4 are Bob Lutz from Wayne, Jack Sandlin of Perry, Frank Mascari whose district straddles Center and Perry, and Vop Osili whose district straddles Center and Wayne. These districts are basically all south of 30th St.
Below is a map of the County, color coded by parcel, for the dollar increase in 2014 property tax bills, should the homestead credit be eliminated. This type of map was presented during last year's debate, as well. If the homestead credit were eliminated, 100 percent of homestead properties in Center, Perry, Pike, and Washington Townships would see an increase in their property tax bill. 69% of homestead properties in Warren, 64% in Wayne, 53% in Lawrence, 33% in Decatur, and 8% in Franklin Townships would see an increased tax bill. Last year we heard the outrageous claim that the homestead credit benefited the rich over the poor. Well, the data again this year, demonstrate that to be false. Of the 47 taxing districts in Marion County, 11 would see no change in tax bills for either a $100,000 or $200,000 house. In 23 of those districts the tax bill would rise more for the owner of a $100,000 house, and in 13 taxing districts the bill would rise more for the owner of the $200,000 house. Hopefully soon, I can link to the information sent out to members of the commission and representatives of the taxing units. Unfortunately, that information is not yet available to the general public. While the topic of ethics is still of interest, I thought I'd take a look at the list of folks who registered as lobbyists with the City of Indianapolis. In 2010, 56 individuals signed up - employed by 32 different companies or firms, representing 72 entities. In 2011, 36 individuals, with 16 different employers, represented 62 entities. In 2012, the numbers were 44 individuals, 23 employers, represented 66 entities. As of today, the 2013 year has 19 individuals, employed by 8 companies or firms, represent 27 entities. The year is young and the budget season has not yet begun, which likely explains the drop from previous years. It may not surprise you to learn that this year 6 individuals, employed by Ice Miller, represent only one client - the Pacers. The Democratic power couple, Carl Drummer and Lacy Johnson, are two of those 6. Any predictions on how the Democrat controlled Council will vote on the CIB sending even more taxpayer dollars over to the Simons later this year? The Indianapolis Motor Speedway has but one person shilling for them. Curious is the apparent need of some not for profit groups to hire lobbyists, rather than drag their own arses over to City Hall to make their own case. For instance, this year Frank Short is representing Visit Indy, Indianapolis Downtown Inc., and the Marion County Recorder. Of course, all three want the flow of tax dollars to continue their way, but why not save some of those tax dollars and speak for yourself? In previous years Wayne Township and the Town of Fishers also hired lobbyists for one reason or another, to implore some governmental group in Marion County. Another oddity, is the double duty some are pulling. Bob Grand, through Barnes & Thornburg, works as a consultant to the Mayor, and simultaneously represents his own lobbying clients. So, too have B&T lawyers Joe Loftus and Bruce Donaldson pulled double duty in past years. Jennifer Ping lobbies for Bose Public Affairs Group on behalf of a few clients, among which she lobbies the MDC for AON Consulting. Ping's husband, Tim Ping, sits on the MDC. Although I expect he recuses himself when anything related to AON Consulting comes to a vote, wouldn't it all be simpler if someone else at Bose took on that particular client? Towing companies seem a bit over represented, considering how few entities are actually noted in the lobby registration database. This year it is Cook's Towing and in previous years it was Zore's. And those represented seem to do quite well. Even to someone like me, who has little memory for company names, these names jump out - Buckingham Companies, Comlux, Corrections Corporation of America, Citizens Energy Group, and Eli Lilly. Not sure what to make of any of this, beyond the thought that it seems like a small number of registered lobbyist and their disclosed clients, compared to those seeking a piece of the taxpayers' $1 Billion Plus City-County budget. Yesterday's raid on City Hall by the FBI was attention grabbing, to say the least. The arrest of two City employees, one who ran the Land Bank (Reggie Walton), and one who had worked as a special assistant to Mayor Ballard himself (John Hawkins) and more recently as an aide to Walton, demonstrated how high up the alleged scheming crept. Of course, the investigation continues and the recent cacophony of shoes dropping could continue apace. U.S. Attorney, Joe Hogsett, held a press conference yesterday afternoon, part of which you can watch atop Jon Murray and John Tuohy's IndyStar article, and which I have embedded below. If you can't watch all 5 minutes, I suggest tuning in at minute marker 4:15, where Hogsett sends a very clear message to those for whom corruption is a companion, beginning with "the era of corruption is over". There are many things in this world I do not understand, but today I want to mention a few arising from yesterday actions and inactions. Why do officials sell out for so little? One of the charges alleged against Walton is that he took a $500 bribe. It is almost heartening that the FBI believes the total take for all 5 people arrested may have topped $100,000. Still, why would folks put themselves in line to go to prison for non-life-changing sums? I suspect the answer lies in the culture of corruption itself and the individuals involved - some of whom may have more good than bad in them, but a powerful ability to rationalize their actions as just part of the game of 'public service'. We all talk about the powerful folks putting certain folks into office so that the real gravy train of millions continues to flow to a handful of well connected individuals. I look forward to the day when those people's fancy offices are subject to a warrant search. But, for those lower on the food chain, the idea that the cracks in public policy should be exploited, not fixed, surely must fall out of the culture set by the big dogs. Reggie Walton sat down at his desk on the 20th floor of the City-County Building a few days after he signed off on the deal, and the thought hit him. I just made someone a millionaire. Once the light of day was shed on the Land Bank policy of selling without restrictions, one would have thought that a) restrictions would be placed on sales of City-owned property in the future and b) any corrupt practices would stop due to the exposure. But, evidently not. No restrictions were placed on either the policy or the corrupt practices. On to the press reaction to Mayor Ballard's absence yesterday. Reported by the Star this morning, is the fact that the FBI informed the Mayor's office Monday night, of its intention to execute a search warrant Tuesday morning. Ballard and his administration had time to work out how to proceed on Tuesday. Hiding all day was their answer. This hiding, by our duly elected but frequently gone Mayor, seems to have stepped over a line for some in the media. I'm happy that they had a line to step over, but I am kind of stunned that they didn't notice his absence from any real governing heretofore.. So, what's the recent count? Two City Councillors. One City attorney who worked as a business partner of a Prosecutor. A Deputy Prosecutor. A Code Enforcement Officer having cars towed, crushed, and sold for metal. All those found or plead guilty. Hopefully Hogsett and the Public Integrity Working Group will continue the joyful sound of dropping shoes; and do so until even those in high places trading power for millions, will take pause and wonder if its worth it to continue bilking the Citizens of Indianapolis. This Friday, the Airport Authority Board will vote on whether to terminate the lawsuit they filed to stop off airport parking in Ameriplex. Prop 148, a Council Resolution that urges them to do so, was postponed at last night's Council meeting, waiting to see exactly what Friday's decision is. As I noted in my last entry, Prop 148 was initiated by Councillor Adamson and co-sponsored by the two district Councillors, Lutz and Holliday, as well as 10 other Councillors in a bipartisan show of support for Decatur Township. In offering the motion to postpone, Adamson had a few thoughts to share, and I, for one, am glad he shared them. I particularly thought it an important idea, that the Airport should consider reimbursing Mid-West Logistics, the owner of the ground in Ameriplex where the Fast Park facility would be built, the $215,000 they spent fighting this frivolous lawsuit. Here are Adamson's comments from the WTCY video of last night's meeting. Authority Board President Mike Wells discussed the issue with other board members and found consensus in support of airport officials’ plans to drop the lawsuit, Duncan said this afternoon. Coincidence or final straw, this comes as the Council readies for Prop 148 on Monday night. This Council Resolution chides the airport for continuing to engage in the lawsuit filed to overturn the land use changes, granted by the Metropolitan Development Commission, that would allow a Fast Park & Relax facility to be built on 31 acres just off Ameriplex Parkway. Lutz was the key driver of the Council's decision last fall, to dock the Airport budget by $100,000; the expected cost of the lawsuit in outside attorneys. He also got 13 Councillors to vote against the entire Airport budget when it came before the full Council. IBJ reporter, Kathleen McLaughlin, reports that Prop 148 may be withdrawn if the termination of the Airport's lawsuit can be directly verified. Adamson initiated Prop 148 and has been a steadfast opponent of the lawsuit. Can this day have finally arrived? I looked on the Airport's website and cannot find any press release. But, Murray has Bob Duncan's comments and I am hearing of email verifications coming from the Mayor's office and from Mike Wells, President of the Airport Authority Board, as well. So, just maybe the wicked witch is not only dead, but most sincerely dead ! This Monday night, May 13, the City County Council will take up Prop 148, among other things. In an unusual move, this Proposal is scheduled for both introduction AND a vote Monday. Prop 148, initiated by Councillor Zach Adamson, and co-sponsored by 12 others, including District Councillors Jason Holliday and Bob Lutz, announces Council support for the Fast Park zoning decision of the MDC and asks the Airport to terminate its lawsuit. This is so very important for my neck of the woods, and I am very excited to see this development. The co-sponsors are a bipartisan group - Adamson, Holliday and Lutz are joined by Councillors Talley, Hickman, Mansfield, Mascari, Moriarty Adams, Evans, Freeman, Pfisterer, Sandlin, and Scales. The Proposal would affirm the Council's support for the zoning decision of the MDC, asks the Airport Authority to terminate its lawsuit, leaves the Mayor the option of signing on to the Special Resolution (like that's going to happen), and would have the Clerk of the Council send a copy of the Resolution to each Airport Authority Board member. It is no secret that I cannot understand why we have to fight our own government because it is trying to create a monopoly by fiat and lawsuit, for a business commonly conducted by the private sector. It is heartening that another branch of our local government will come to our aide in our fight. Thanks to all the co-sponsors and an 'in-advance' thank you to all the Councillors who vote in support of Prop 148 ! On Tuesday, the Centers for Medicare & Medicaid Services released data from 2011, listing the average charges by 3300 hospitals across the Country for each of 100 services. As part of the Obama administration’s work to make our health care system more affordable and accountable, data are being released that show significant variation across the country and within communities in what hospitals charge for common inpatient services. The hope is that transparency will aid in informing the customers of the range of charges for the same services, so that they can ask appropriate questions before they sign on the dotted line. I ran across articles from the LA Times and the NY Times in yesterday's Google news feed about this. The down loadable database on the CMMS webpage is searchable by city, state, procedure, etc. So, I searched Indianapolis. Then I pulled out the services where the range of charges were either at least two-fold, or the span was at least $25,000. That narrowed the 100 services to 20. Below is listed those 20, the hospitals that the CMMS database included as providing those services, and the average charge by each hospital. Due to the limited width capacity of this blog space, I also uploaded more detail on these services to Google Drive - that document also including the number of patients involved and the average total payment made to each hospital for each service. All numbers are from the CMMS database. The provider's average charge for services covered by Medicare for all discharges in the DRG [code for each service provided]. These will vary from hospital to hospital because of differences in hospital charge structures. I have highlighted in red, the highest charge and hospital doing so, for each service, and highlighted in blue, the lowest charge and the hospital doing so, for each service. The first half of at least $5.8 million from RebuildIndy funds to be used for the insane cricket/Gaelic sports complex in Councillor Ben Hunter's district was spent yesterday. This action comes despite no basis in sanity for such a complex and despite no private partner to help with the cost and/or to reap the Ballard fantasize rewards. Streets and sidewalks are crumbling, crime is skyrocketing, IMPD has fewer police officers patrolling the streets than the day Mayor Greg Ballard took office in January, 2008 and the budgets of city agencies across the board are being slashed to make up for a multi-million dollar budget deficit, but Mayor Greg Ballard insists on spending millions of dollars intended for infrastructure improvements on a new world sports park on the city's east side that he hopes will play host to international cricketing events. IndyStar reporter, Jon Murray, reports that none of the three Council appointees showed up for the vote. The three Board of Public Works appointees from the Mayor's office joined with DPW Director, Lori Miser, to vote 4-0 in favor. The Council appointees need to explain why they were not there, especially given the gravity of the vote. The Council Democrat leadership wants to say the Council has been cut out of this decision, but that is not entirely so. Ducking important issues by standing on the sidelines is not leadership. The lack of votes by the three Council appointees, if left unexplained, leaves the option that the Democrat leadership wants this cricket nonsense to go forward as much as Ballard does, as a reasonable opinion for members of the public to hold. I do have to note that some Councillors did weigh in - as I cited two days ago -- Councillors Zach Adamson and Christine Scales, in particular. Meanwhile, the priorities of the Ballard administration continue to spiral out of the realm of an sane policy and have clearly entered the Twilight Zone. Let us all remember this come budget time, when the Council Democrat leadership and the Ballard administration join hands to eliminate the Homestead Credit from property tax bills and when they cut services and when they lay off cops and firefighters (either directly or through attrition). Let us remember the insanity of this cricket crap. Councillor Christine Scales also had her say in an email on Cricket. Her email was addressed to members of the Council's Public Works Committee. Due to my concern over the Mayor's spending of Rebuild Indy funds for a cricket stadium, I have reviewed the Public Works meeting and City Council minutes for Proposal 337 of 2011. Council Democrats repeatedly raised concerns that there was a lack of specificity in the proposal as to the types of projects for which the Rebuild Indy funds would be used. Republicans made comments such as historically, projects were never provided at that point in the budget period. Also stated was that the passing of this proposal was necessary to insure that the funds would be protected and used for infrastructure purposes, as well as to address abandoned housing demolition costs," as promised"-i.e from the water company sale. As I read over the minutes, I see that the majority of funds were directed to Character 4 into the Rebuild Indy Subfund of the Consolidated County Fund for capital expenses. Has there been an accounting of what funds have been used thus far and for what specific purposes? It appears that Rebuild Indy funds are indeed now being used in a way that Proposal 337 was intended to protect it from being used for. How can $1.5 million for renovation of the west wing of the City Market be described as an appropriation for roads, sidewalks, curbs, abandoned housing? How does over $6 million for a cricket stadium fill that description? I provided My fellow Republican Caucus members with articles describing the lack of success of the only cricket stadium in the country sanctioned by the International Cricket Association. It is located in Lauderhill, Florida(Broward County). The stadium had all the elements needed for guaranteed success. The metropolitan area it is located in, boasts a population of over 500,000 Caribbean nationals. Cricket is their passion. The overall population of the metropolitan area is almost 6 million. There are hundreds of cricket teams and leagues all across Florida. The climate is conducive to year round play. Yet the stadium hosted few major cricket tournaments. City officials blame the US American Cricket Association for its problems. Cricket matches and tournaments need to be sanctioned by USACA. The city of Lauderhill has struggled for years to have their proposals for matches and tournaments approved by the USACA. I uncovered an even more recent article from the Sunday Sentinel than the ones I sent out to caucus members on Sunday. In it Mayor Kaplan, of Lauderhill Florida, questions why Mayor Ballard would build a cricket stadium unless he has received a firm, long term commitment(contract) from the USACA for a set number of tournaments for a period of years. It is likely that without such, Indianapolis will guaranteed find ourselves in a similar situation to theirs. In the difficult fiscal times we find ourselves in, I don't believe that spending millions on a cricket stadium should be a budgeting priority. I believe we were"played" by not having the Proposal 337's final language more specific about what types of projects the Rebuild Indy monies could be used for. It's now obvious that "Capital Outlay" has come to mean whatever one wants it to mean. The Public Works Board meets tomorrow, Wednesday, May8th, to award a contract for the World Sports Park. I urge Public Works Committee members to contact Public Works Board members and ask them to vote against the awarding of this contract with the use of Rebuild Indy funds. I will forward copies of the related articles in another email. The names and email addresses of Board members are listed below my name.